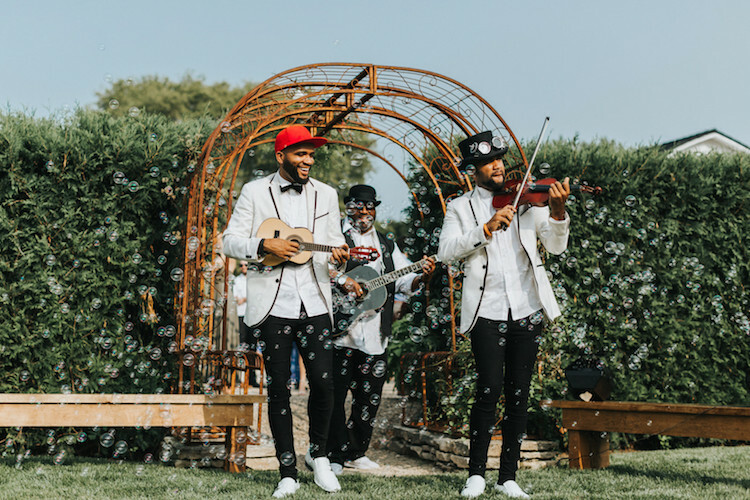 Anna and Alex are event planners in the Twin Cities, so it makes sense that their organic greenery and gold outdoor wedding was filled loads of epic details, lots of laughter and fun! 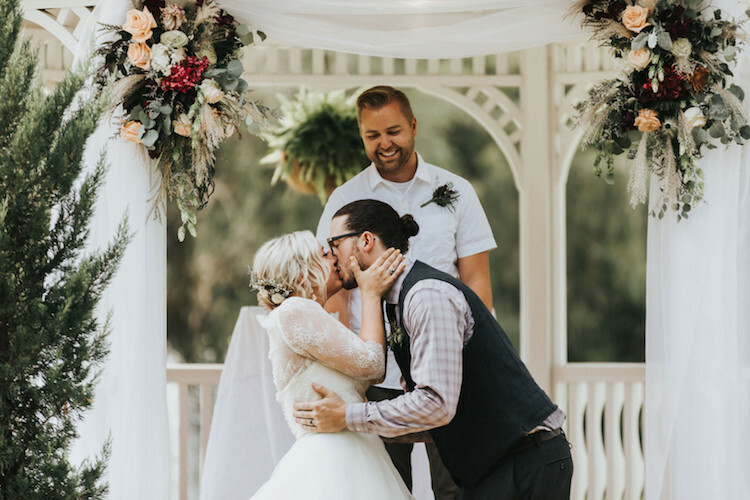 This awesome pair’s romantic wedding was inspired by their first vacation together was to California where they traveled the hills of Sonoma, touring wineries together. 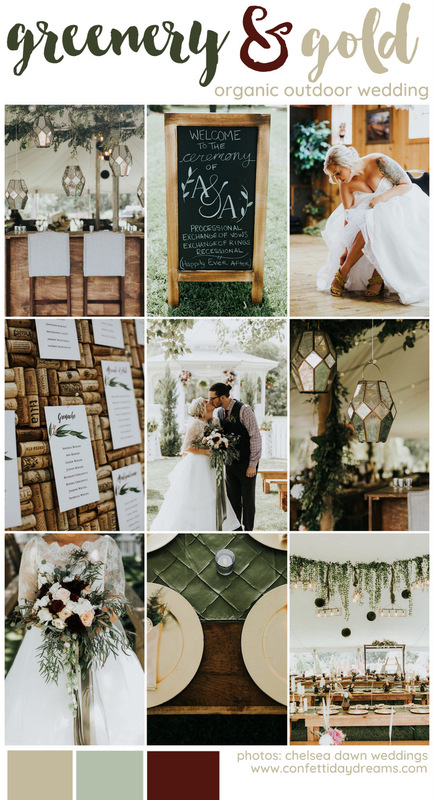 They worked in a palette of purples, burgundy, mustard, gold and greenery, to create a vineyard-themed wedding – lush with wedding greenery yet balanced with organic textures. 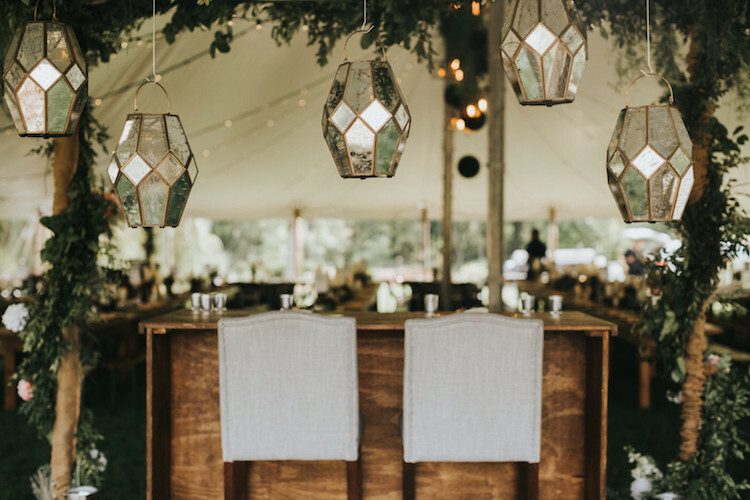 They included linen-free harvest tables, galvanized metal accents, corks, and rugged wine barrels topped with food and drink. 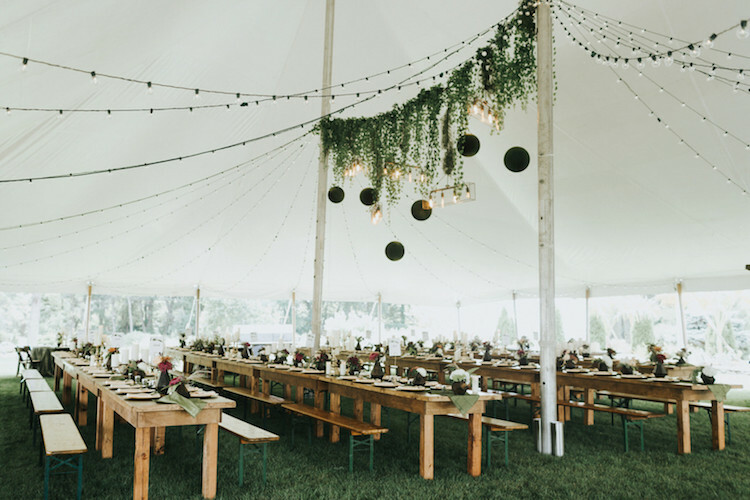 Their wedding reception tent was full of neutral florals, industrial-like edison-bulb fixtures, and heavy garlands. By night, they had a soft, moody glow from the overwhelming amount of cafe-lighting. 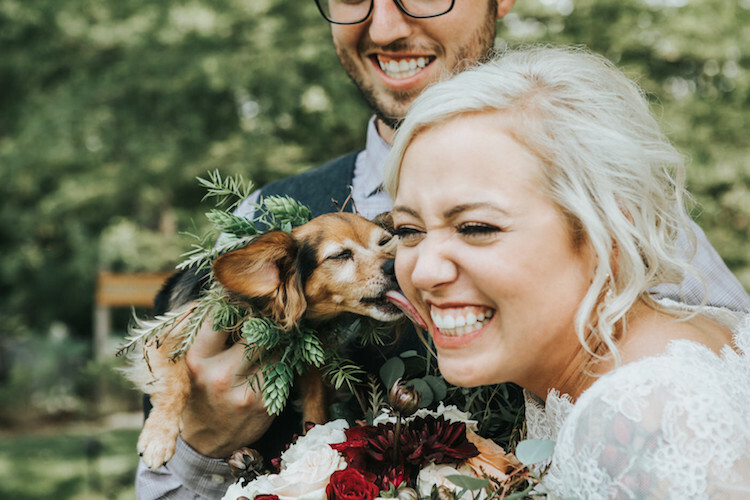 Lucky for us, Chelsea Dawn Weddings brings us all these fun-filled images of their celebration. 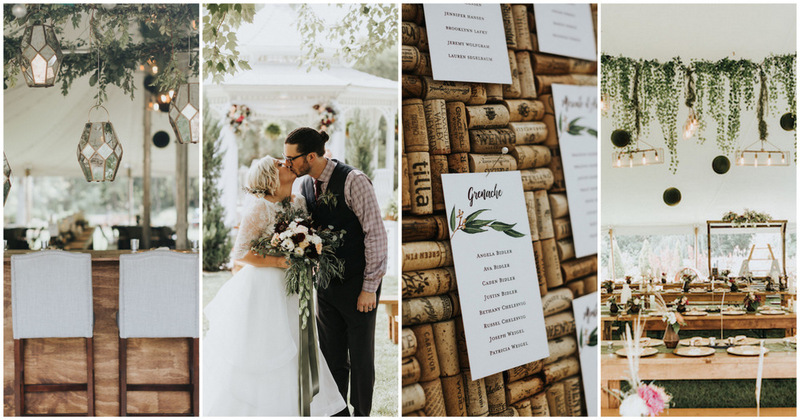 To bring their wine theme full circle, the couple had a shadow box etched with their wedding monogram where guests signed and dropped corks into as our guestbook (and is now hanging in our kitchen). 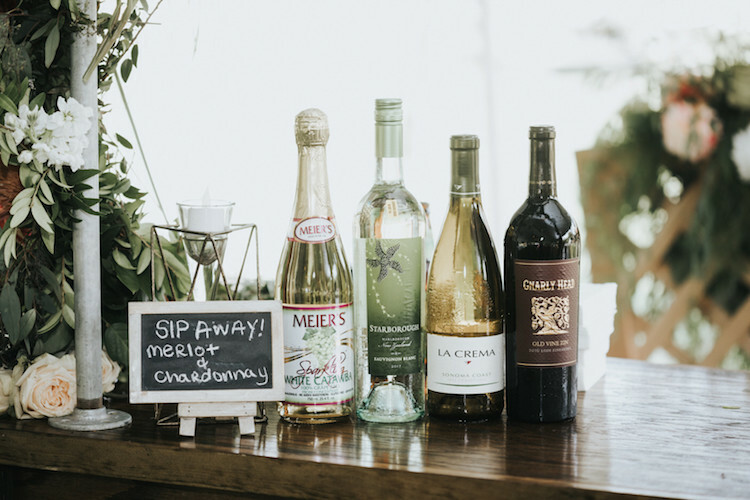 Their wedding favors were monogrammed stemless wine glasses (filled with favorite red and white wines), and each table’s ‘number’ was actually different types of wine (merlot, chardonnay, pinot noir). The couple, who are known among their friends as being quirky and playful, also included loads of fun games and activities for their guests to enjoy during cocktail hour. 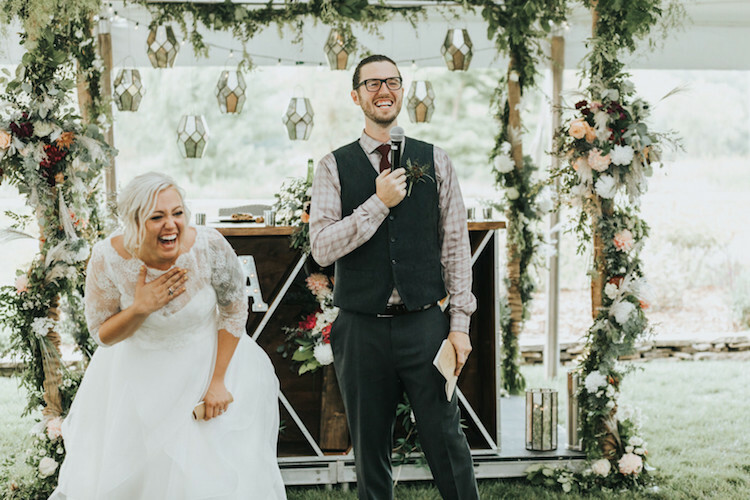 Love Story: Alex and I met when working in the event planning industry (in fact, all of our coworkers actually helped us plan and execute our wedding day!). Anything Alex and I do is usually very well thought out, detailed, and highly-organized. So of course, so was the proposal. On closing day of buying our first single-family-home, Alex had a ‘surprise breakfast’ penciled into our calendars (we put everything on the calendar). On our way “to breakfast” Alex took a detour, parked the car, and we began walking to what I thought was the restaurant. As we approached a bridge, Alex walked me across a fence that spelled out “ANNA, WILL YOU MARRY ME?” I was in shock. Nearby city buses started honking, people cheered out of their office building windows, and a nearby (planned) photographer captured every moment. I wore a layered chiffon ballgown which look made my waist look tiny – an instant win. Once I added a high-neck, scalloped lace bolero – it sealed the deal. I have a half-sleeve tattoo, so it was nice to have it semi-covered for some of our more formal photos. Once the party started I took it off for a second look (and sunset photos)! I ended the late night hours in an all-white jumper that I rented from rent the runway online so I could go “full party girl!” (genius!). I did my own make-up with a summer glow (and took several Sephora classes over the course of 9 months to perfect it. Ladies, you can totally do your own make-up!). My hair was an effortless, tossled, piecey bun with added floral. Alex kept it simple with oxblood shoes, a check-shirt, and a textured vest (for some added rustic vibes). Fun socks were a must for my goofy guy! 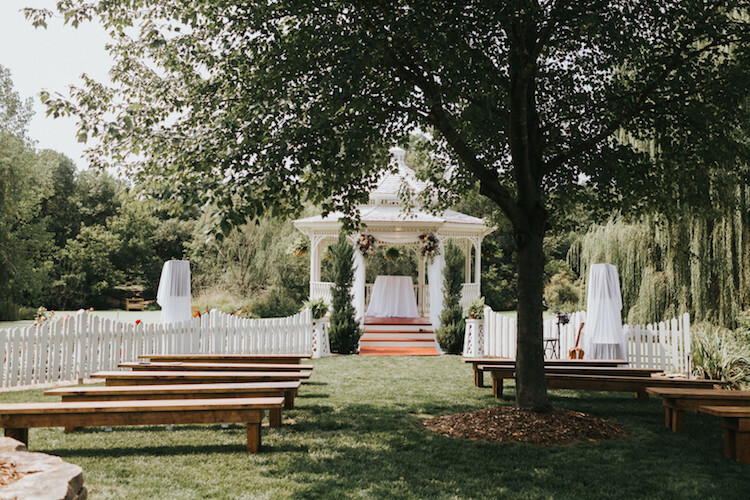 The wedding ceremony setting itself created a beautiful backdrop. Teddi (our event planner and friend) had a couple of vintage rugs that she brought in for us to stand on which offered some bohemian texture. 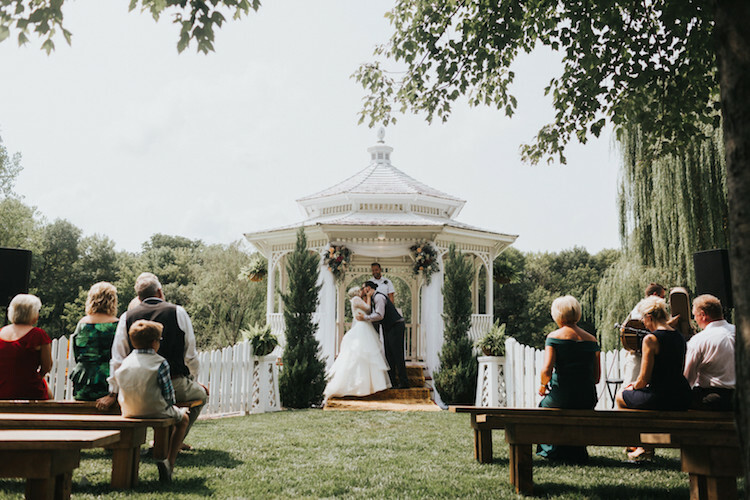 Sheer drape and large statement floral arrangements adorned the gazebo as our family sat together on rustic wooden benches. Our ceremony was super quaint and intimate. Only immediate family was invited (less than 15 people in total), which kept things light-hearted and relaxed. My brother [being the officiant] used informal language that was inclusive of all dynamics. Alex’s brother-in-law sang three selected songs – which included acoustic covers from John Mayer, Elton John and The Beatles. We also specifically requested that our grandparents sign our marriage certificate as our witnesses. 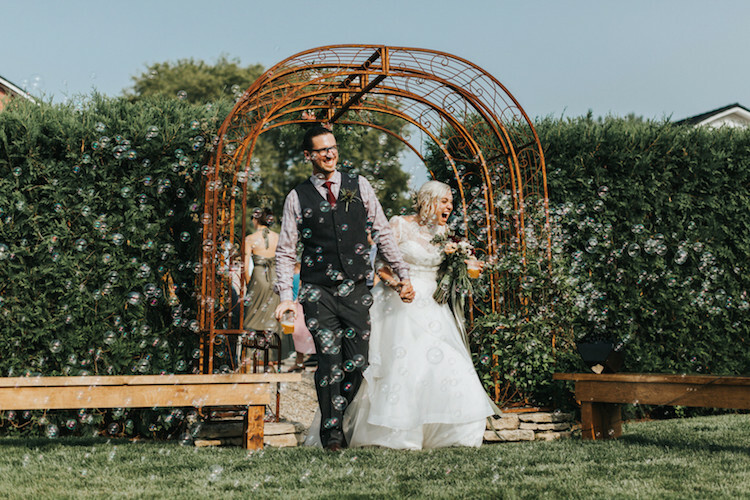 Many of our flowers were “from the land” – Alex’s Dad planted especially for our florist to use and incorporate throughout the bouquet, boutineers, center-pieces and more. 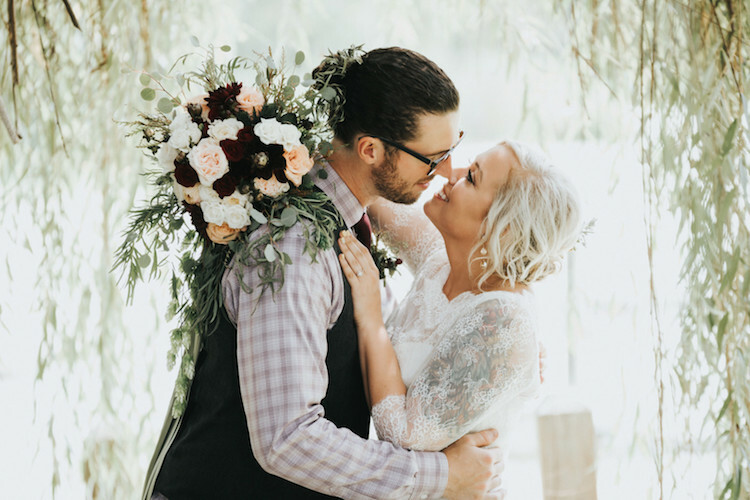 He incorporated blush and ivory flowers, along with a deep/dark purple potato vine to pull our color-scheme throughout the lush green backdrop that already existed. His father even imported tropicals to make it feel extra special and bring in tons of added texture! This was a personal touch that I wasn’t expecting to be so moving, as it constantly gave me a reminder of all the love and hardwork that went into planning our day. 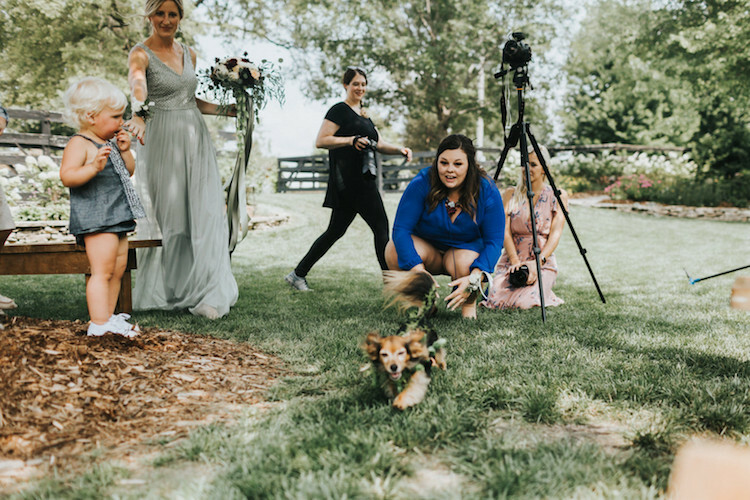 We knew we wanted our puppy as the ring-bearer for a fun, casual feel. We chose to opt-out of a wedding party altogether, which was very refreshing. 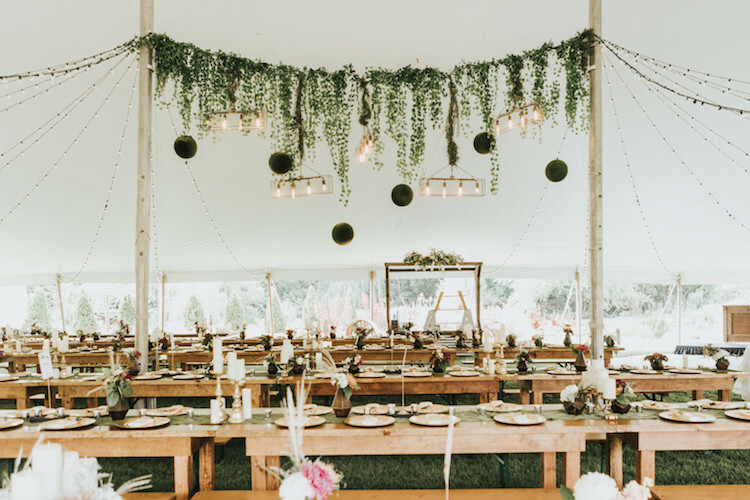 We paired silver dollar eucalyptus with vines we plucked from the willow trees to help fill in as garland (commercial garland is way too expensive!) as our focal floral. We also incorporated fluffy tall grasses that would give off this awesome sheen when it caught the sun just right. Dark purple potato vine, plush dark dahlias, blush and ivory garden roses, and ACTUAL hops were additions that offered a punch of color. 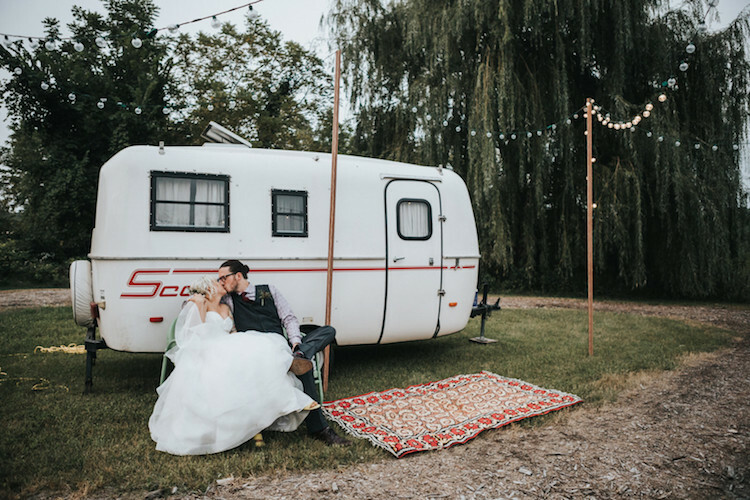 We invited our closest friends to set-up-camp at our venue. We ended up having 53 of our closest friends bring in tents, campers, and RVs for an after-party. In fact, we joined in by renting our very own vintage ‘scamper’ which made for an epic photo opp! 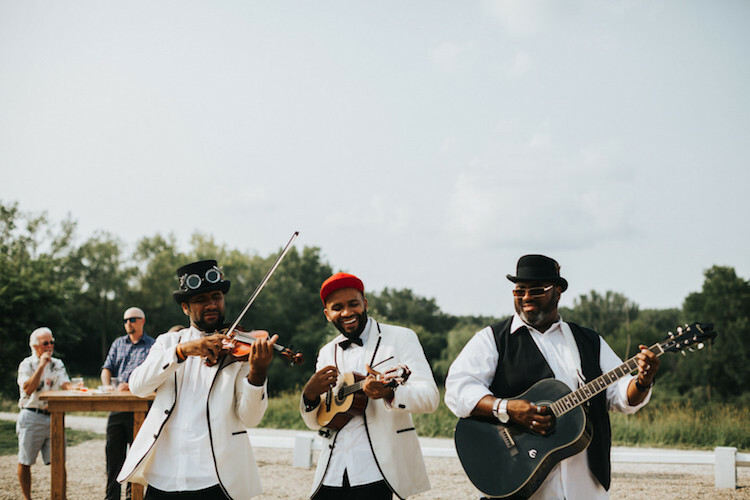 Our favorite part of the entire reception was our musical talent – the BVtazilian 2wins! Alex knew these guys from living with them in the dorms at UNI; including them in our big day was a no brainer. Since our ceremony was so small, all of our invitations were “reception-only” guests. We waited in the barn while our guests arrived and began playing games in the peat-rock area. Our event planner and friend (Teddi) included a bubble machine which was a complete surprise, and actually totally childlike and fun! During ‘cocktail hour’, the 2wins escorted us out and around the barn – announcing us as Mr. & Mrs. 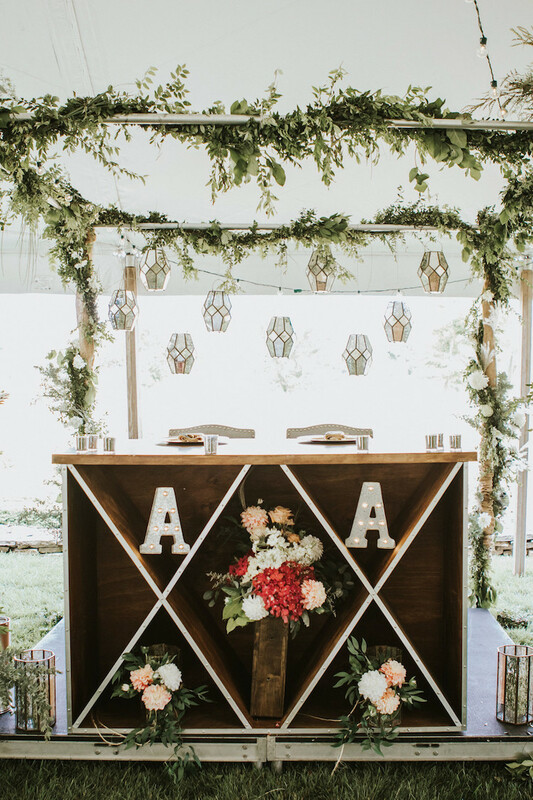 Guests took pre-poured monogrammed stemless wine glasses as they signed and dropped wine corks into a mongrammed shadow box. Although we didn’t assign seats, we did place guests at specific tables organized by different types of wine to fit the theme. The 2wins walked around together and provided tons of entertainment for our guests, and that is BEFORE they mic’d up to the DJ and began breakdancing – they were SO AWESOME!!! 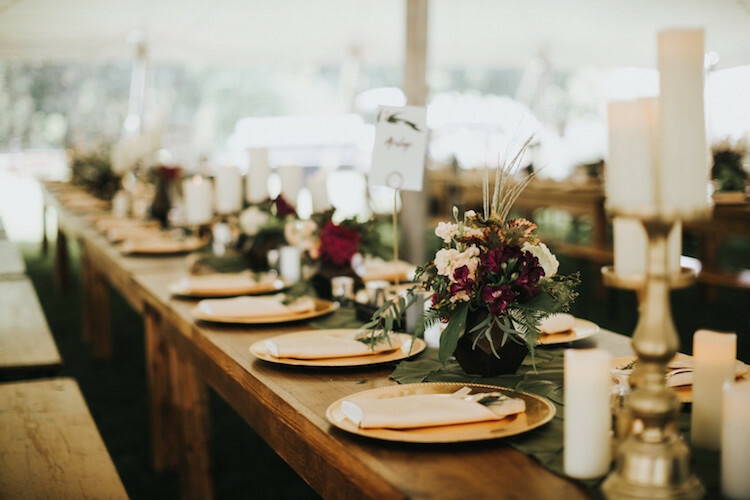 At our tented outdoor wedding reception we had simple and sophisticated floral arrangements, as well as candles, which sat on top of a green pintuck runner and wooden harvest table. I loved looking out and seeing everyone sitting together – laughing and hugging each other. Go on your honeymoon within two weeks after your wedding if you can! Go linenless – not only will you save in linen rental costs, but also cleaning costs. Give a speech – I am deathly afraid of public speaking, but I’m so glad I got the chance to tell everyone how grateful I was. 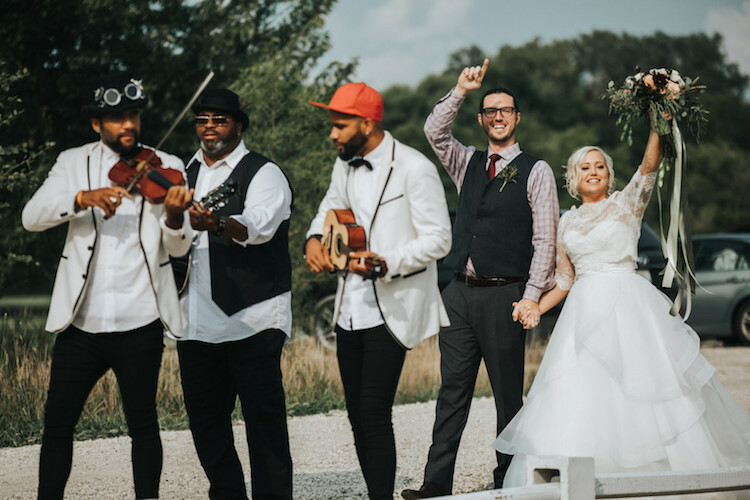 Include the cheesy ‘how to dance’ songs like electric slide, macarena, and footloose…we asked our DJ not to play it, but ended up giving in and it definitely got people more engaged. Create checklists and complete a little at a time. It’s so easy to get overwhelmed- just have fun with it all. Do whatever YOU want to do – this day is all about two people falling in love and committing to ‘forever’. Don’t take this day lightly – be sure to take moments to soak it all in and feel the movement of everyone. Don’t feel like you absolutely have to talk to everyone, you’re likely going to miss someone and that is OK. 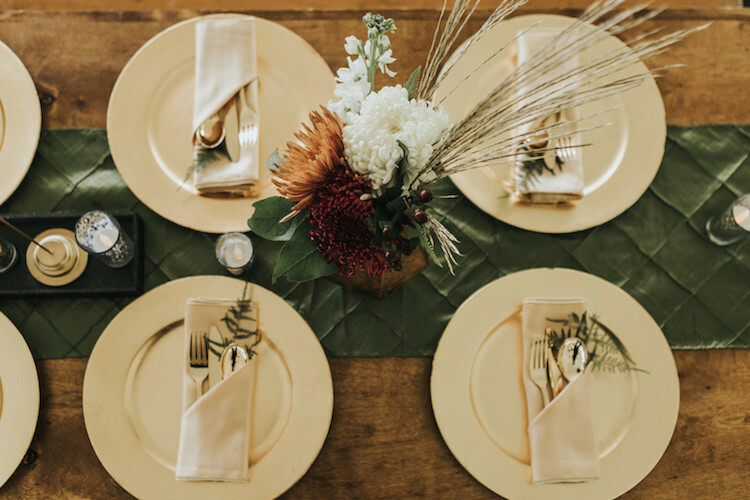 Absolutely invest in a first look (and add a personalized gifting to each other if you can) – this completely relaxed me, and are now some of my favorite photos (and memories) from the entire day!